For years, I have dabbled occasionally in fishing at night. Many of my largest fish have been caught at night, although that is a bit misleading since a lot of those were stripers. Long nights spent stripping streamers also resulted in a big brown trout here and there. 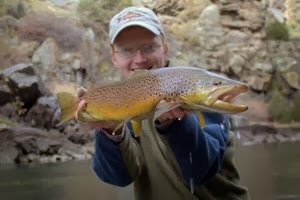 One thing eluded me though: catching a big brown trout on a mouse pattern. For the last couple of years, I have been inspired by my buddy Bryan Allison. 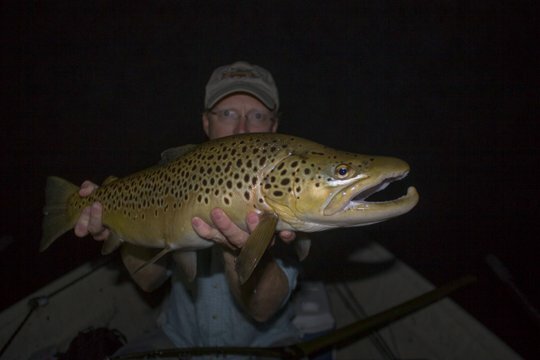 Recently, his monster 30" brown trout on a night time mouse trip got me thinking about mousing again. Fast forward to a few weeks back when my friend Brandon Bailes checked in about the possibility of fishing the Caney Fork River. We have been trying to get our schedules together for a while, but this was the first time it looked like we could finally make it happen. 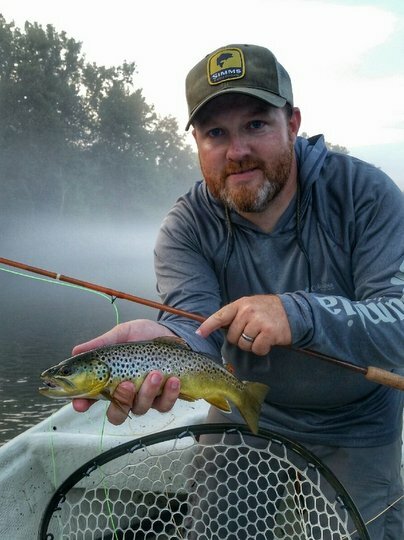 Yesterday, I started the day off early with a morning guide trip on the Caney Fork. After a quick lunch break midday, I headed back to the river to meet Brandon and get ready for our evening float. Imagine my surprise when he handed me a handful of his own creations. For anyone that doesn't know Brandon, he is an extremely talented fly tier who sometimes does orders for people who need some good custom tied flies. If you are interested in getting flies from him, then contact me, and I'll put you in touch with him. I couldn't bring myself to fish such beautiful flies, but I did grab a mouse pattern from the bunch and added it to my box...just in case. After dumping the boat and running the shuttle, we started floating around 4:00 PM. Brandon started off on streamers and stuck with those faithfully until near dusk. I wanted to see how the nymph fishing was for future guide trips, so I drowned some flies under an indicator. Early in the float, Brandon started having some really nice flashes on the streamer. We were both stoked for the evening and what it had to offer. Soon, my indicator dove, and I had a nice fish on. A battle scarred rainbow hit the bottom of the net moments later, and I got a quick picture. Just downstream, Brandon nailed a couple of beautiful brown trout on his streamer. We continued into the gathering darkness. By the time we were halfway through the float, we stopped for a brief dry fly session. Brandon nailed some nice browns on a flying ant of his. The fish were sipping in gentle currents as they are prone to do in the last light of day. The hits indicated that the fish were not altogether unfamiliar with terrestrials which is good news for the fly angler. Light was failing fast now and before we continued through the second half of our float, we took the time to exchange sinking lines and streamers for floating lines and mouse patterns. Yes, you read that correctly...big nasty rodent imitations. Did I mention that Brandon ties some amazing flies? I dug out the fly that he had just gifted me with and tied it on to some stout 12 lb. fluorocarbon tippet. If a fish happened to hit, the last thing I wanted to do was worry if my line would hold. The anchor was pulled back up and the boat continued into the mysterious darkness of night. We had no idea if trout would come out to play or not, but there is only one way to find out. This float is not for anyone unfamiliar with the river. Even on low water you could get yourself into some problems if you don't know where you are going. Thankfully, having rowed this river countless times, I could nearly do it with my eyes closed. All of those daylight floats really pay off when you fish at night. Sometimes you are thankful just to see a silhouette of trees against the stars for navigation. Other times, the river is wide and lazy and there are few opportunities for danger. Some sections are just too tight for safe casting and those we rowed quickly through. Along the way, we discussed everything either of us had read on large predatory brown trout. Feeding habits and patterns were recalled and we began trying to really target specific water types where we expected these fish might happen to be at. At the end of one long pool, Brandon had an explosive strike but the fish refused to hit again. The same thing happened another 200 yards downstream, except this time the fish hit a second time and was briefly hooked. Then there was a lot of futile casting. Those two hits had us excited, but the next couple of hours just demonstrated how important it is to put in your time on these big fish. We were drifting into a flat area that I always like to fish on low or high water. The fish just always seem to be there. I directed Brandon towards the left side of the boat where I expected the fish to be, and I aimlessly slung some casts to the right just in case. About the time I was thinking about pulling my fly out of the water for the final time and just working the oars it happened. Despite being in a section that I thought was wide open, my fly suddenly seemed very heavy. As I kept stripping, the heavy feeling began to throb, and I realized I was feeling the head shakes of a big fish as the "log" I thought I had hooked came alive. The fish was clearly large, but how large we wouldn't know for several minutes. For a few seconds I questioned whether I had somehow nailed a smaller striper, but quickly discarded that for the lack of a scorching run. Even so, I briefly saw my backing before quickly getting the line back on the reel. The 7 weight rod was doubled under the weight of the monster. Brandon grabbed the net and a headlamp as I kept working the rod and the fish. 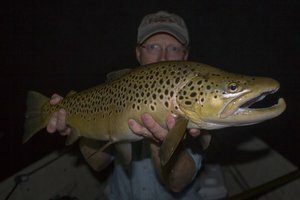 It surfaced briefly just on the edge of the feeble glow from our light, and I knew it was only another moment before my big brown trout was in the net. Finally, Brandon slipped the big boat net under the fish. I was glad for the large version of the Fishpond Nomad Boat Net. Anything smaller for a net and I would have been a nervous wreck. As it was, I was shaking and not from the cool night air. This fish was a monster with a big kype jaw. In other words, I had just landed my dream big brown trout on the Caney Fork River. For the second summer in a row, I found a new personal best fish on this special river. The next few moments were a scramble to keep the big fish in the water, set up some lighting, dig out the camera, and get ready for a couple of quick pictures. That accomplished, I then held the fish facing upstream in the gentle current. I probably spent longer than necessary holding on to this fish. I didn't want to let it go until I was absolutely certain that it was healthy and ready to swim another day. Fish like this are a treat to be enjoyed by other anglers again and again. Let them go so they can grow! 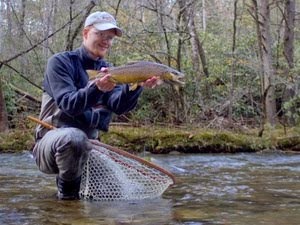 The Caney Fork River is amazing in its ability to produce big trout. 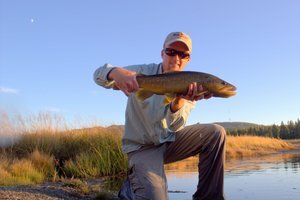 The river can support a surprising number of very large fish given the opportunity. Good catch and release practices go a long ways towards insuring the opportunity for others to enjoy this fishery. If you enjoy catching big fish like the one above, release your catch. If I was ever going to put a fish on the wall, this one was probably the fish. It was perfect in every way, from the big kype jaw, to the rich coloration, and of course it was a big fish. Instead, I prefer to see them swim away to be caught another day. Thanks to Brandon Bailes for coming to fish with me and kindly taking these great pictures. Also thanks for the winning mouse pattern! Check out his work if you need some effective, big fish catching flies! 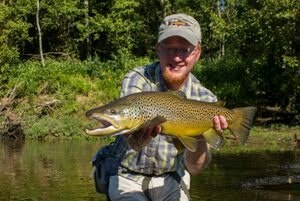 Very nice big brown! Congrats! I've had some luck as well on the mouse. One question, looks like there is no fog, everytime I go I can't see my hand in front of me. Was it foggy? Ok, I saw your drift boat picture and saw that it was starting to get foggy and then the other pic was clear. I have had zero luck getting night shots in the foggy dark so bad that I can't make anything out. Glad you got a good pic and brown! Good for you, David! I look forward to fishing with you on August 15! I've been catching fish the past two weeks on midge emergers on the Caney. It is indeed a great river! Congrats, that is an incredible fish! I've caught some good fish on mice but I'm still waiting for that one. congrats on that big beautiful brown. At the end of your story you commented that if you ever were to get a fish mounted this would be the one. You should contact Advanced Taxidermy and have a replica made. They are out of Canada and do incredible work and brown trout just happen to be there specialty. I moused in northern Michigan last year. we did not get on the water till 10pm. Fish till the sun had risen. Nothing like letting the mouse swing accross the stream.........then bang!!!! !